- This specially designed holder and insert system ensures that all the concerned people are well aware of the current status of the structure. A scaffold should be fitted at all ladder access points from the first build stage and is to remain on the structure until dismantled thereby communicating a safety message to all. - Available in multiple color options like red, yellow and green. - This is customize tag hence we can print and display as per the matter required also printed front and back in different language Hindi and English. Can be customized, basis on customer requirements. 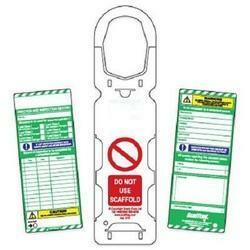 We are counted amongst the top companies involved in offering a wide range of Scaffolding Tags. . These Scaffolding Tags is highly appreciated among our clients due to their fine quality, long life and reliable nature. Offered products are available in market various sizes and specifications as per the clients requirements. 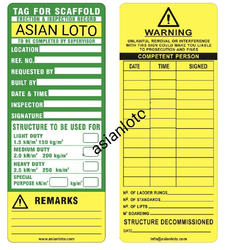 We manufacture Scaffold Safety Tag hung at Inspection sites to ensure Safety of the Labours at construction sites where inspection is required.